Jeremy Fox is a highly sought after arranger and educator. He maintains a busy schedule of clinic/workshops, including his own called the SMV Vocal Jazz Camps (www.VocalJazzCamp.com) and the Jazz Theory Boot Camp (www.JazzTheoryBootCamp.com). NEW CHARTS, NEW CHARTS, NEW CHARTS! Jeremy just published a BUNCH of new charts, with more coming soon! Check them out at Jeremy’s Score Store! Jeremy TEACHES AT THE SCHOOL FOR MUSIC VOCATIONS! Jeremy is back teaching full-time at The School for Music Vocations (SMV) in Creston, Iowa. He is honored to have the opportunity to return to work with the Professional Music majors there, to direct ensembles there, and honor a program that was started by his mentor Phil Mattson. His wife Kathryn has joined the school faculty as well – teaching applied strings, piano, voice, music fundamentals, and ear-training. Just a note that the SMV is the ONLY 2-year vocational music program in North America. Its unique harmony-based curriculum allows EVERY music major to take jazz/classical piano and arranging every semester at the school – along with classes in rehearsal techniques, recording studio production, classical/jazz theory, ear-training, and jazz performance, among other classes. If you know of someone who would benefit from this curriculum, contact Jeremy ASAP as the school is currently accepting applications and auditions for Spring and Fall of 2019. Jeremy DIREcTS Second Annual "SMV REAL GROUP FESTIVAL" at the school for music vocations APRIL 5-6, 2019!!!! Last year at the School for Music Vocations, Jeremy directed the inaugural SMV Real Group Festival (for vocal jazz, a cappella, chamber, and madrigal choirs). There was a brand new festival format that includes a length forty-minute clinics with members of The Real Group paired with non-Scandinavian clinicians. Then, ensembles performed back-to-back for each other at the end of the morning session, and at the end of the afternoon session – receiving recorded and written comments. For an additional fee, (on a first-come first-served basis), ensembles booked a 60- to 75-minute recording session to record a selection or two in our state-of-the-art recording studio. To register for the 2019 SMV Real Group Festival on April 5-6, 2019, head to our www.VocalJazzFest.com website. Newly licensed charts with PERUSAL VIDEOS AT JEREMY's SCORE STORE! To program one of Jeremy's new arrangements/compositions for your ensemble, visit the Vocal Score Store. You can now perusal many of his charts there. For any questions, please feel free to contact Jeremy. Jeremy DIRECTS ALL-STATE JAZZ CHOIRS IN NEW YORK, NEBRASKA, Wisconsin & North Dakota in 2017-18 – and will conduct ARIZONA and ILLINOIS ALL-STATE JAZZ CHOIR in 2018-19! For Jeremy's complete schedule, click here. JEREMY ACCEPTING COMMISSIONS FOR 2019! Would you like Jeremy to write for YOUR vocal group, choir, big band, or orchestra? It is a surprisingly easy process to commission Jeremy for 2019, and all starts by filling out this form! If you are interested, contact Jeremy as soon as possible to schedule your commission! JEREMY RETURNS FROM CUBA CONDUCTING BOSSA NOVA SINFONICO! Jeremy was nominated in the 57th Annual Grammy Awards for his arrangement of "All My Tomorrows", featuring vocalist Kate McGarry, and flugelhorn player Jared Hall. The track features more than 40 orchestral players, piano (Daniel Strange), guitar (René Toledo), bass (Geoff Saunders), and drums (Michael Piolet). Assistant engineering were Stefania Martinez, Kelly Garner, and Jason Richmond. Mastering by Bill Hare. The arrangement is from Jeremy's "With Love" album, which is available at iTunes and Amazon, as well as other digital stores. 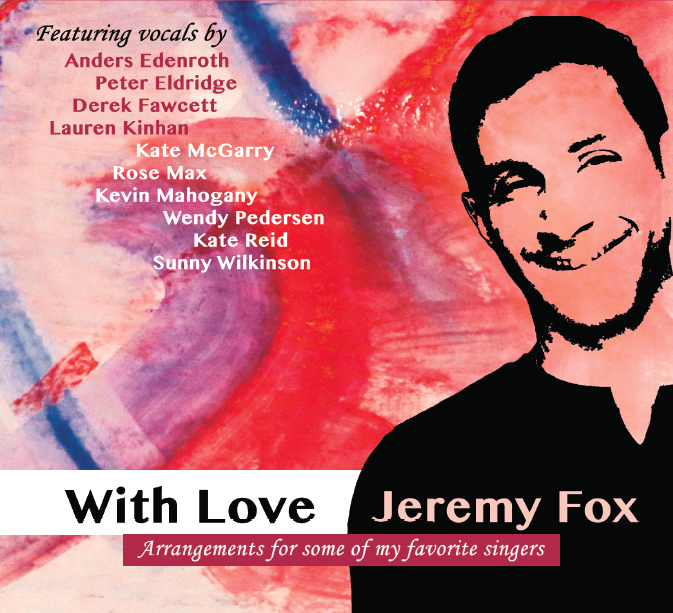 The album features 11 of Jeremy's orchestral and big band arrangements sung by a stunning line-up of vocalists: Kate McGarry, Kate Reid, Sunny Wilkinson, Peter Eldridge, Lauren Kinhan, Wendy Pedersen, Derek Fawcett, Anders Edenroth, Rose Max and Kevin Mahogany. Order the album by clicking here!